Finding a hotel in Kuala Lumpur isn’t hard. With tourist numbers to Malaysia hitting around 33 million people in 2018, a high percentage of inbound visitors will make Kuala Lumpur their first (and sometimes only) stop. As such, there is a large supply of hotels and resorts in the capital city to cater to the needs of all visitors. Ranging from budget accommodation and hostels through to sturdy three-star options. At the luxury end, there are many four and five-star hotels, apartments and resorts spread across the city. The Dorsett Kuala Lumpur is located right in the heart of one of Kuala Lumpur’s busiest areas, the Golden Triangle. It’s the perfect spot for those visitors to KL who want everything at their fingertips. Easily accessible to the city, the night market in Jalan Alor, and many of the super-sized shopping malls, there is no need for a vehicle of any kind. Walking is easy and if you need to go a little further the taxis are plentiful. The Dorsett has a range of rooms to suit singles, couples and families. Adjacent to the Dorsett you will also find the Dorsett Residences, perfect for longer stays. The staff are friendly and the food available for both the buffet breakfast and in the restaurants is of a very high standard. The Dorsett Kuala Lumpur is a four-star hotel in Kuala Lumpur. Check current prices and availability. The entrance to the Dorsett Grand Subang is impressive, with a wide-open lobby, striking timber columns and sweeping staircases. The mezzanine level with its wide verandahs also adds to the sense of space. It’s light and airy and immediately has a resort appeal, even though it’s not. The hotel is located in Selangor, approximately 30 minutes from the city by car (traffic dependent). The beauty of staying in a location such as this is you get reasonable proximity to the city, but you feel as though you are a world away from it. Surrounded by trees and with outdoor gardens made to feel as though you are at a resort, the big city seems quite some distance away. Even though it’s not. From many of the 478 rooms, views of nearby parks and the city can be seen. Stylishly appointed rooms contain all the modern conveniences. The executive level (and above) rooms also come with a special added extra, a smartphone to use during your stay. Fully loaded with a working sim card, this is an excellent feature for those who might travel without a local sim. For rooms with Club Lounge access, the views from this private sanctuary are impressive. The hotel has a large gym which helps to attract a range of high profile sports teams. The provision of food to guests is very important at the Dorsett Grand Subang. With four cafes, bars and restaurants, there is enough to satisfy every type of guest and their food requirements. The premier restaurant is the Emperor, serving excellent traditional and modern Cantonese cuisine. Private dining rooms are also available for booking which are just perfect for Chinese family meals. Selangor is one of KL’s more luxurious suburbs. The hotel is close to shopping malls and the Sunway Lagoon Theme Park, a well-known destination. It’s one of the best things for families to do in Kuala Lumpur. Kuala Lumpur International Airport is approximately 35 minutes drive from the hotel. The Dorsett Grand Subang is a five-star hotel in Kuala Lumpur. Check current prices and availability. 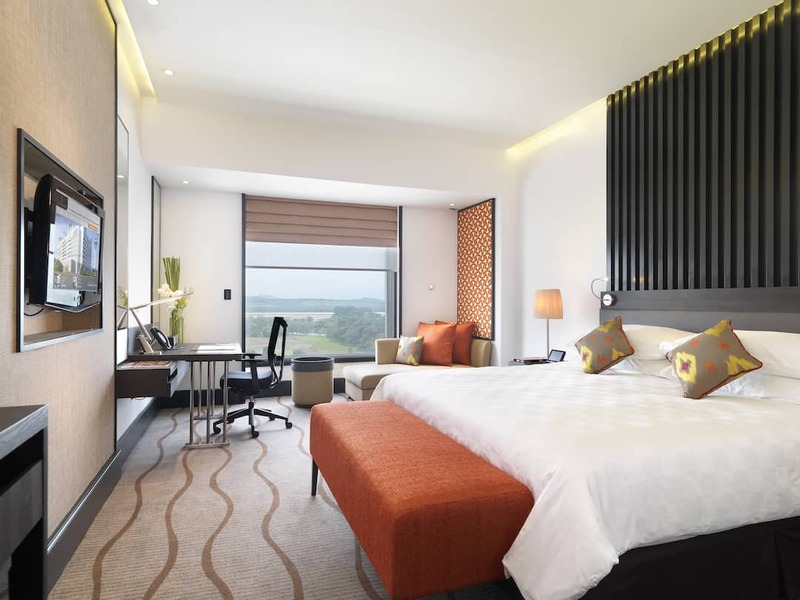 If the Dorsett Grand Subang has shades of feeling like a resort, then the Saujana Hotel is the real deal. 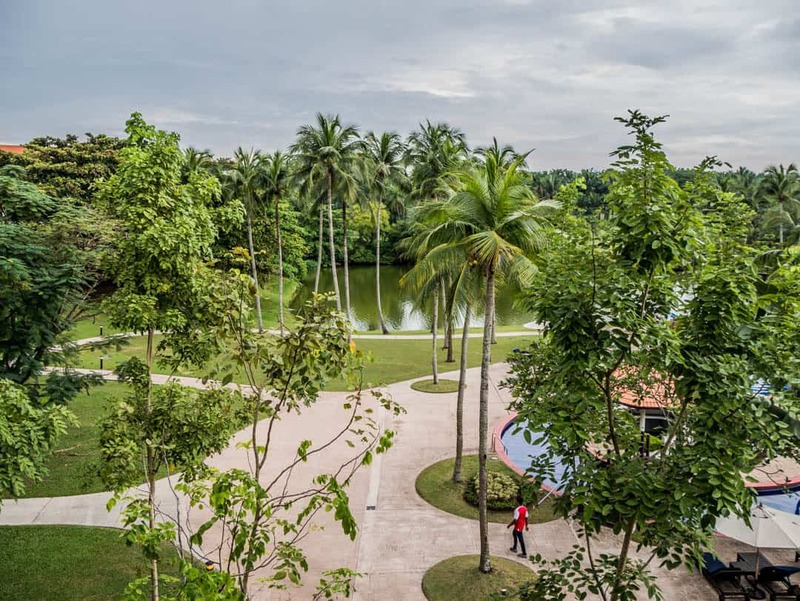 Approximately seven kilometres from the Grand Subang, it’s located right in the heart of some incredible tropical greenery in the Subang Shah Alam area. The rooms, both standard and club rooms are impressive, as are the room rates. I still can’t believe how much you get for your money here at the Saujana Hotel. The dining options are excellent and the best tip I could give would be to try as many of them as possible while you are here. From Italian to traditional Malaysian to amazing modern cuisine at Charcoal Restaurant, you are spoilt for choice. Enjoy the spa and one of two pools, or play a round of golf at the adjacent course. It is located approximately 35 minutes drive from the Kuala Lumpur International Airport. The Saujana Hotel is a five-star hotel in Kuala Lumpur. Check current prices and availability. 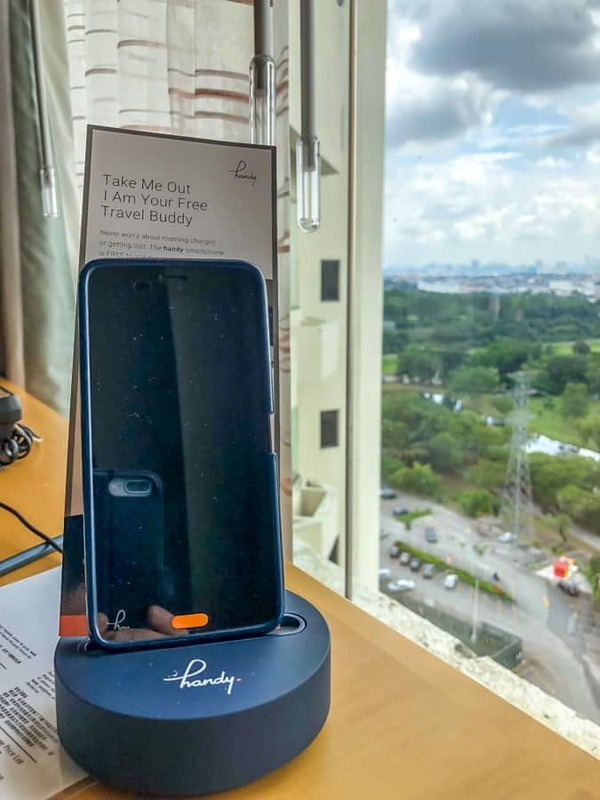 If you have a quick stopover in Kuala Lumpur and don’t need easy access to the city then staying close to the airport is often the best choice you can make. Finding good hotels near airports can be difficult. Thankfully, the Sama-Sama Hotel near the Kuala Lumpur International Airport makes the decision much simpler. It is adjacent to the main airport terminal. If you do need to get to the city, the KLIA Express train will get you there in under 30 minutes. The Sama-Sama Hotel understands the need for traveller convenience. They know their market, who typically stay at airports because they are under time pressure. As such, they have introduced a unique process that assists with their guests making a more streamlined transition from the airport to the hotel. Whilst guests are waiting for their luggage, the staff at the nearby Sama-Sama counter can check you in. There is also a complimentary buggy that operates between the airport and the hotel if you don’t have the time or inclination to walk via the sky bridge. If you are arriving at the KLIA2 airport, a hotel shuttle is also available. The lobby here is stunning with the addition of columns of light representing palm trees and fresh orchids. 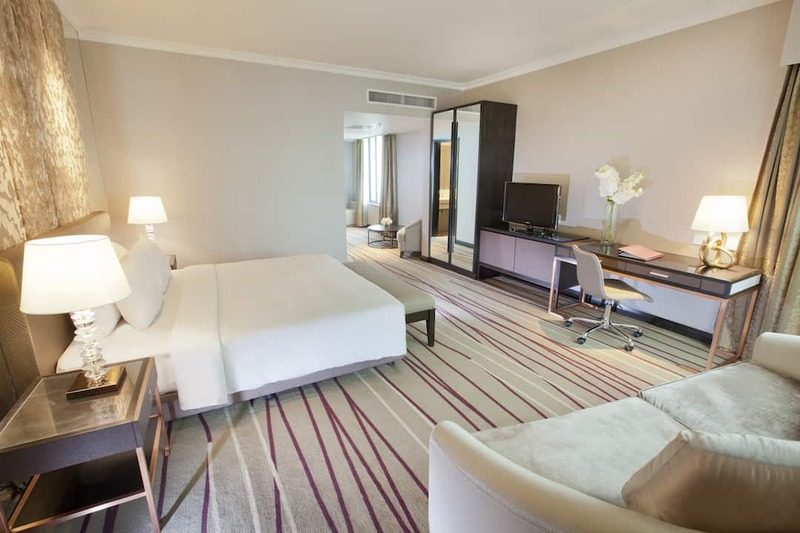 There are 442 rooms ranging from the deluxe offering right through to the Presidential Suite. The Premier level rooms include access to the lounge for breakfast, evening cocktails and use of all business facilities in a restricted access area. To help with recovering from your flight, there is a 24-hour gym and resort pool. The Sama-Sama Hotel is a five-star hotel in Kuala Lumpur. Check current prices and availability. For a good Kuala Lumpur Airport transit hotel, look no further than the Sama-Sama Express. It is an airside transit hotel located within the Kuala Lumpur International Airport. This hotel is perfect for travellers on a layover in Kuala Lumpur. If you are on a layover, check-in is simple with a counter provided at the airport. This can be done without having to clear customs. The hotel has basic provisions, providing enough for weary travellers needing a rest, but without a large price tag. You are paying for comfort and convenience here. There is also a Sama-Sama Express located airside at the Kulala Lumpur International Airport 2 also. The Sama-Sama Express Hotels are three-star hotels in Kuala Lumpur. Check prices and availability. For more hotel reviews on hotels in Asia, check our Stay with Me page.